How does solar electric work? What rebates are available in the Four Corners area? How does solar work with the utility company? Will my panels be damaged by extreme weather? What happens at night, or on a cloudy day? Solar electric or photovoltaic (PV) panels convert the sun’s energy into electricity. The process of changing light (photons) into electricity (voltage) is known as the photovoltaic effect. The electricity travels from the panels through wires to conversion equipment and then into your house. If your system is grid-tied (connected to the utility grid) then any excess electricity you produce will travel back to the grid and your meter will run backward. If your system is off-grid (not connected to the utility grid) then your excess electricity will be stored in a battery. Solar Electric (PV) Panels: Solar electric panels convert sunlight into electricity with no moving parts and inert materials. The panels absorb the sun’s light, which frees electrons from semi-conducting atoms. The electrons are then able to flow through wires producing electricity. All the panels we use have been thoroughly tested for resistance to hail and wind damage. Inverters: The electricity produced by the solar panels flows from the panels through wires to the inverter. The inverter converts the DC (Direct Current) electricity produced by the panel into the conventional AC (Alternating Current) electricity used by your home. Electric Meter: With net-metering, when production exceeds use, the meter spins backward and homeowners receive credit from the local utility. Performance Monitoring: An optional monitor provides a private and secure means for observing power output. Monitoring can ensure maximum power output and allow homeowners to view their energy production and usage. Mounting Equipment: The solar array is typically attached to a roof. Where shading or architectural details make roof mounting impractical, a pole mount can be used instead. We use a weather and corrosion resistant mounting structure designed to withstand Colorado and New Mexico’s challenging wind and snow. Anchor points are triple sealed to ensure no leaks throughout the life of the system. Indeed, the solar system actually protects the roof area underneath it from the elements and can prolong the roof’s life. Making the decision to purchase a solar system – in essence buying 30 to 50 years of electricity all at once – can be a difficult one. The first major factor is whether you have an electric bill sufficient to offset at the utility’s retail rate (what they charge you, on average about 11¢/kilowatt-hour (kW-hr)). If your solar system produces more than you consume throughout the course of a whole year (i.e. your system is too large), then you’ll be selling energy back to the utility, but only at their wholesale rate, usually around 6¢ per kW-hr, and your return on investment will be lower. So if your electric consumption is very low, then only a very small solar system would be suitable. But smaller solar systems can cost more per watt (lacking an economy of scale), so as a general rule, a minimum electric bill of $30-$50/mos. is needed, but over $100/mos. on average is better. Meanwhile, the overall efficiency of the home or business must be considered. Generally speaking, implementing energy efficiency measures (such as improving insulation, changing to compact fluorescent light bulbs or LEDs, and replacing older inefficient appliances with newer more efficient models), will yield quicker savings and a better return on investment, so should be implemented first. If we at Living Solar identify this as a better first course of action, we always advise our clients and provide references to energy auditors that can perform a more detailed analysis and make specific recommendations. If your home or business is already energy efficient and has a sufficient energy consumption though, you’ll need roof space with solar access – mostly free of shade and preferably facing within 60°, or better 30°, of due south. The roof will also need an area free of obstructions, such as HVAC units or vents, sufficient in size to both fit the solar array and avoid shading from the obstructions. If the roof is shaded or has insufficient area clear of obstructions, we often install ground-mount systems that are either fixed in direction, or more often, track the sun throughout the day (producing about 30% more electricity than the fixed system – covering the added cost of the tracking equipment). What rebates are available in the Four Corners states? The Energy Policy Act of 2005 established a federal tax credit for the purchase and installation of both home and business solar electric systems. The credit is equal to 30% of your portion of the system with no cap. Businesses can also take advantage of accelerated depreciation. Local utility rebates vary from one utility in our service area to another, and can change over time, so please contact us for the most up-to-date information. Living Solar’s expertise in understanding and applying the myriad of tax credits, grants, and loan guarantee options is unsurpassed. We welcome the opportunity to discuss if and how these incentives apply to your situation, so feel free to contact us today. It’s simple. Living Solar ensures the highest levels of Experience, Quality, and Integrity available from any solar installer. SunPower and other solar panels we install are warranted for 25 years, while inverters are warranted for 10 years. 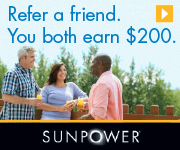 SunPower provides the best warranty in the industry. Living Solar provides a consulting-based approach – helping you to learn about and understand the most workable, efficient, and cost-effective renewable energy options. If we identify energy efficiency measures as a better first solution for a home or business, we will encourage you to first obtain an energy audit if necessary, and implement more cost-effective solutions before going solar. With each proposal, Living Solar provides full disclosure in how we arrive at payback, return-on-investment, and other financial return projections. We would always look forward to discussing the assumptions, and their rationale, utilized in these sometimes complex calculations. 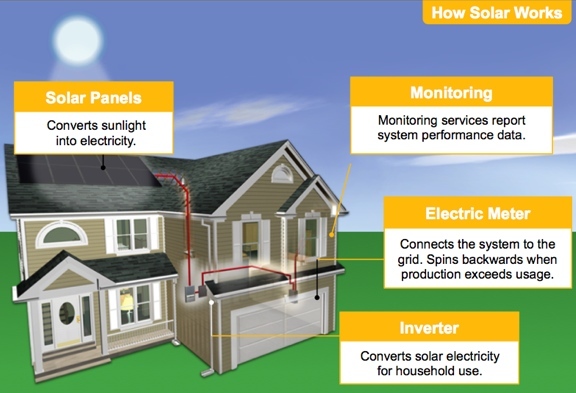 All grid-tied (connected to the utility electric system) solar systems are connected to the grid via what is known as net metering. With net metering, your meter will run backwards at any moment when the solar system’s production of energy is greater than your consumption. You are given retail credit for the excess energy you produce from one month to the next. If you have credit left over at the end of the year (often settled up in April), the utility generally purchases that energy from you at their wholesale price. Specifics of net-metering policies vary among utilities in the Four Corners, and occasionally change, so contact us for the most up to date information. The solar industry standard is that panels be able to withstand 3/4″ diameter hail stones with a speed of 60 mph. All of the panels we use pass these hail impact tests. Living Solar design’s your system to withstand the basic wind speed required by your town or county’s building codes, while the panels themselves have passed various stress and wind loading tests. Meanwhile, SunPower provides the strongest, most reliable warranty of any solar panel in the industry. Your solar panels will only produce electricity when they receive sunlight. You will need electricity, however, even when your panels are shaded. Systems that are grid-tied (connected to the utility electric grid) draw energy from the grid when electricity is not being produced by the panels (your meter spins forward as normal), but when your solar system produces more energy than you consume (for instance during a sunny day when you aren’t home and your lights and appliances are mostly turned off), the meter will spin backwards. Systems that are not grid-tied usually have battery back-up storage. This means that systems that are not grid tied must overproduce during the day and store the energy in a battery. The stored energy can then be used at night or when the panels are shaded.